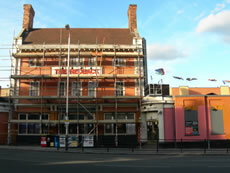 The Pub today - about to receive a make-over? Ealing Council announced this week that they have invested £3000 in a new taxi-marshalling scheme to stop weekend revellers using illegal mini cabs, which can leave them vulnerable to attack. due to staffing and other difficulties. The Community Safety Team and Safer Neighbourhood Teams are trying to work together to encourage partygoers to use licensed mini-cab companies at the end of the night. Ealing Council have said that "20 PCSOs [will] marshal the car park, keep watch over pub goers and ensure there is no trouble in the queue. PS Norcutt says: "To date we have never had 20 staff on duty for the event. Our staff are spread from the Redback Tavern to Morrison Plc's car park and beyond. Only 6 maximum have been used in the car park." Over the course of the weekend an estimated 1000 people use illegal mini cabs in the Acton area to make their journey home. Some men have been assaulted and some women seriously sexually assaulted by illegal minicab drivers. The plan was for the Council to set up temporary railings in the evenings to prevent pedestrians from spilling over into the road. The railings are also needed to direct people towards Morrisons car park, where registered mini cabs are lined up to take people home. But PS Norcutt has stated that presently there are insufficient railings to have any effect. He says: "The area covered is so far only a quarter of the area required. However, this issue has been addressed by the police who will be providing temporary railings to cover the whole area needed." "Dangerous situations have arisen with people accepting lifts from bogus mini cabs. People should be able to enjoy a safe night out in the borough without the fear of becoming a victim of crime. "This scheme will help make that possible by offering anyone in the area a safe way to get home. " The scheme is functioning, PS Phil Norcutt agrees, but he would not be satisfied putting out a police news release until this was a proven and effective operation, capable of policing itself. He said: "The operation so far has been too sporadic to have had any consistency and a further meeting is planned to address some of the issues next week. At this meeting, all the agencies involved (Acton Police, Ealing Council, The Redback Management and Management of a local cab company) will try to iron out the issues involved."